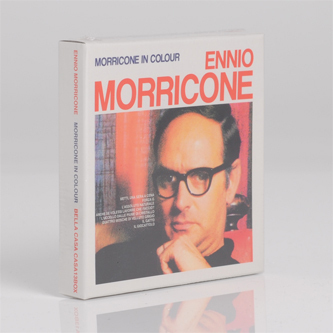 *4CD Box Set featuring 70 tracks from the Morriconne Archives* "With his peerless versatility and productivity, Ennio Morricone is one of the most famous and influential composers of the twentieth century. Drawing from an extraordinary range of musical styles, his 500 film scores have accompanied every conceivable musical genre. Morricone's innovative soundscapes for Sergio Leone's mid-sixties spaghetti westerns changed film music forever. In any context, the composer's work is a formidable combination of eclecticism, sensuality and playfulness. The arty erotica of Giuseppe Patroni Griffi's Metti, una sera a cena is perfectly complimented by Morricone's cool jazz score and his music gives humour and great beauty to such offbeat period pieces as Forza g and Il Gatto and the abstraction that is L'assoluto naturale (starring the Yugoslavian actress Sylvia Koscina and the superb Laurence Harvey). Arguably the most impressive of the set are the composer's scores for the early Argento giallos, The Bird with the Crystal Plumage and Four Flies on Grey Velvet. In the former, Morricone's ominous, haunting music establishes an almost unbearable suspense and for the latter combines bracing atonality with a send up of progressive rock (the director's first experiment with such music and a prelude to Goblin)"